Psychoactive drugs are a class of chemical substances that act on the central nervous system and can alter behavior and cognition . All psychoactive drugs are highly fat-soluble and thus cross the blood-brain barrier readily. Psychoactive drugs alter synaptic transmission by altering neuro-transmitter amounts and availability or by affecting receptor activity. In addition to the drug's primary effects on behaviors such as arousal, thought processes, mood, perception, and consciousness, psychoactive drugs can produce a variety of nonbehavioral effects that may more directly affect health and, in some instances, can lead to death. Although there are several different classification schemes for psychoactive drugs (pharmacological, legal, medical), the most common organization is based on their effect on behavior and cognition. According to this scheme, psychoactive drugs can be classified into four broad categories: (1) sedatives and hypnotics, (2) stimulants, (3) opiates, and (4) hallucinogens and psychedelics. Sedatives and hypnotics depress or inhibit brain activity and produce drowsiness, sedation, or sleep; relieve anxiety; and lower inhibition. Although the depressant compounds do not share a common neural mechanism of action, most of them either decrease the metabolic activity in the brain or increase the transmission of the principal inhibitory neurotransmitter of the brain, gamma-aminobutyric acid (GABA). All sedatives have the potential for addiction and dependency. Common depressants include barbiturates, such as Seconal; benzodiazepines, such as Xanax and Valium (commonly called minor tranquilizers); nonbarbiturate sedatives, such as methaqualone; newer nonbenzodiazepines, such as buspirone, antihistamines, and anesthetics; and alcohol. In low doses, alcohol can act as a stimulant; however, with increased dosage alcohol's main effect is depressive. Stimulants produce behavioral arousal. As with the sedatives and hypnotics, there are a variety of substances, each with a different neural mechanism of action. Examples of stimulants are amphetamine, cocaine, antidepressants, caffeine (the most widely used psychoactive drug in the world), nicotine or tobacco, appetite suppressants, and a variety of exotic plant products. Stimulants vary in strength, legal status, and the manner in which they are taken; however, all stimulants have addictive potential. 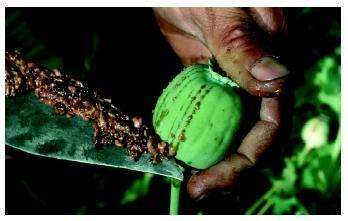 The milky juice of unripe seed pods is used to make opium from the opium poppy plant. All drugs in the opiate class act on opiate receptors in the brain. They mediate relief from pain and produce feelings of euphoria. Opiates, which are referred to as narcotics by scientists and medical practitioners, are highly addictive and can either be natural, semisynthetic, or synthetic. Natural opiates such as opium are derived from the opium poppy. The active ingredients of opium are morphine and codeine. The most common semisynthetic opiate is heroin, which is five to ten times more potent than morphine. Examples of synthetic opiates include methadone and the prescription pain medication Demerol. Hallucinogens and psychedelics do not share a common mechanism of action, but all induce hallucinations . These drugs can either be natural such as mescaline, which is derived from the peyote cactus, or synthetic such as lysergic acid diethylamide (LSD), but they are typically classified pharmacologically according to the affected neurotransmitter system. Cholinergic psychodelics (drugs altering acetylcholine transmission) include physostigmine, scopolamine, and atropine. Drugs that alter norepinephrine transmission include mescaline and ecstasy . Drugs that alter serotonin transmission include LSD and psilocin. Other drugs in this category include the psychedelic anesthetics phencyclidine (PCP) and ketamine. Marijuana, which is derived from the hemp plant Cannabis sativa, is often classified as a psychedelic substance, although only in very high doses does it produce sensory distortions. Marijuana's most common behavioral symptom is sedation. Unlike other drug classes, and with the exception of the cholinergic psychedelics, hallucinogenic and psychedelic drugs are generally nonlethal even when taken in large doses. Additionally, there are a number of other drugs that affect central nervous system functioning. These compounds are used to treat a variety of psychological and neurological disorders and include antidepressants, antipsychotic medication, and drugs for epilepsy, Parkinson's disease, the dementias (such as Alzheimer Disease), and spasticity . A different approach to the classification of psychoactive drugs is taken by the legal system, which considers all illegal drugs or controlled substances "narcotics." According to the Comprehensive Drug Abuse Prevention and Control Act of 1970, drugs are categorized into five schedules according to the perceived risk of dependency. Schedule I drugs, such as heroin, marijuana, and most psychedelics, have a high risk of dependency and no widely accepted medical use. These drugs are forbidden and cannot be obtained even by prescription (although marijuana is available in some states). Schedule II drugs, such as morphine, codeine, amphetamines, and certain barbiturates, have a high risk of dependency but are accepted by the medical community for treatment. Schedule III drugs have a risk of moderate physical dependency or high risk of psychological dependency and include preparations with limited opiates (morphine) and barbiturates not in Schedule II. Schedule IV drugs, which include the benzodiazepines, have a slight risk of mild physical or psychological dependency. Schedule V drugs have less risk of mild physical or psychological dependency. Finally, alcohol and tobacco are not classified under this law. They fall under the jurisdiction of the Bureau of Alcohol, Tobacco and Firearms (ATF), which is a division of the U.S. Department of the Treasury. Goodman, Louis S., et al., eds. Goodman & Gilman's The Pharmacological Basis of Therapeutics, 9th ed. Elmsford, NY: McGraw-Hill, 2000. Ross, R. T. How to Examine the Nervous System, 2nd ed. Stamford, CT: Appleton & Lange, 1999. Schatzberg, Alan F., and Charles B. Nemeroff, eds. Textbook of Pharmacology, 2nd ed. Washington, DC: American Psychiatric Press, 1995.